From the small business owner to Fortune 200 CEOs, the highly skilled and accomplished manager understands and practices what Ed Eppley calls professional management. And like any other professional — athlete, musician, physician — mastering the skills required to be a professional manager takes continuous practice, fine tuning, and commitment. Ed has trained companies around the world. 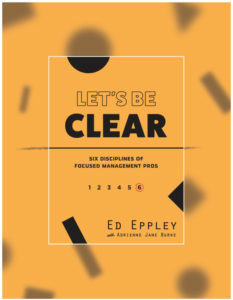 In his new book, “Let’s Be Clear: 6 Disciplines of Focused Management Pros,” he brings that knowledge and expertise to a broader audience with an in-depth look at the full scope of professional management. He breaks down the six disciplines critical for today’s professional manager, explains the role of each practice, how to implement it and why it’s critical to master it. Every business owner, CEO and professional manager has room to become better. By committing to the professional management disciplines outlined in “Let’s Be Clear,” today’s leaders can develop a competitive edge for the future while building a sustainable and thriving business. Learn more through the press kit here.